Sh. Mangla Ram Bishnoi was born on 30th June, 1978 at Barmer district. 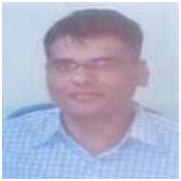 He joined Rajasthan Account Services on 04.01.2011. He started his career as Rajasthan Account Services in 2011 as under training, HCM RIPA, Jaipur. He appointed as Comptroller, AU, Jodhpur on 20.03.2018. Before Joining at AU, Jodhpur, he has worked Comptroller Sardar Patel University of Police, Jodhpur.He also worked in different capacities such as Project Officer (Accounts) in Zila Parishad, Barmer etc.